Having spent my working life in overseas tourism finding the perfect place to spend my retirement was a big decision. When I first started looking several years ago the dream of living off grid was very appealing. Being single in the middle of nowhere could have had its problems in later years. Then quite by accident I came across Guia and immediately realised that this ticked every box on my wish list. Guia dates back to 1620 and was originally named Nossa Senhora da Guia after the church. The Church still stands and overlooks the main square and is well worth a visit. Inside you will find a rich ornate alter piece, carved vaulted wooden ceiling which has captured the smell of incense over the centuries. Every Sunday morning the main square is turned into a bustling market where you can purchase fresh local fruit, vegetables, bread, cheeses and fish. There are several patisseries, restaurants serving traditional fare and various shops in which to browse. For the serious shopper you have the towns of Pombal, Figuiera da Foz and Leiria within a short drive. Guia railway station was originally used for the transportation of wood which was the main industry of the area. Now there are several trains daily which meander along the coast stopping at various villages. If you are in a hurry the toll road can have you in Lisbon within an hour and half or Porto a little over. The Station ticket office and waiting room is now a bar which occasionally features live music, well worth a visit if you are returning or waiting for a train. If you are an outdoor enthusiast you will not be disappointed as Guia boarders the National Forest where the scent of the Pine and Eucalyptus fills the air. Here you can follow one of the many walking or bike trails whilst seeing an abundance of wildlife. 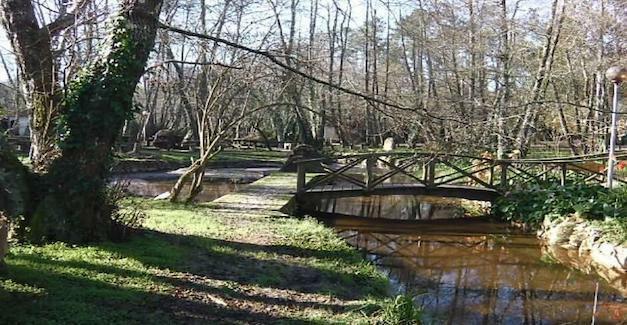 Within the forest you will find Lagoa da Ervedeira a fresh water lagoon along with picnic areas and a sandy beach. A few minutes’ drive from Guia you will find two spectacular beaches Praia do Pedrogao, peaceful in winter yet in summer comes alive with cafes and restaurants serving locally caught fish. Here you will find life guards patrolling during the busy season. The other beach is Osso de Baleia which is a locally kept secret and mainly used by the local community. Here you will find the sand dunes and miles of sandy beach along with a bar serving cold drinks and ice creams. If you want a place to relax and be with nature this is the place to be. Expo Fargo takes place each year at the display ground. You will be treated to various folklore music and dancing, every night there is a different Portuguese band performing. There are various Tasquinhas serving traditional cuisine as well as Ginger the local liquor served in a chocolate cup. Local trade’s people have stalls displaying everything from Pottery to handmade furniture.